Despite its name, Typo Berlin, founded in 1996, has never been solely dedicated to type, and this year’s ‘Beyond Design’ theme broadened its scope further. We had music (Debra Shaw), comedy (Spanish duo Brosmind, illustration’s Flight of the Conchords), self-help (Maria Giudice, who vainly commanded delegates to ‘bring out your inner DEO’ – Design Executive Officer) and a whiff of ‘Design Thinking’. Sonja Knecht asked Jon Barnbrook whether she should call him English or British. His reply – ‘I’m a European’ – elicited whoops of delight. As a sentiment that did not make it ‘beyond design’, this was, in retrospect, a bittersweet highlight. Nadine Chahine commanded the big ‘Hall’ stage with ‘Designing for split-second clarity’. She talked us through complex research on legibility in the automotive industry, in particular reading at speed and at night, giving lucid explanations of the challenges facing sign and dashboard typography, especially users with poor eyesight. She hammered home her points: ‘Age differences are significant in legibility … it’s a call to action to be more inclusive.’ Research shows that using white on black type for night-time reading makes type harder to read. When road-users are processing such information at speed, in difficult conditions, typography is genuinely a matter of life and death. 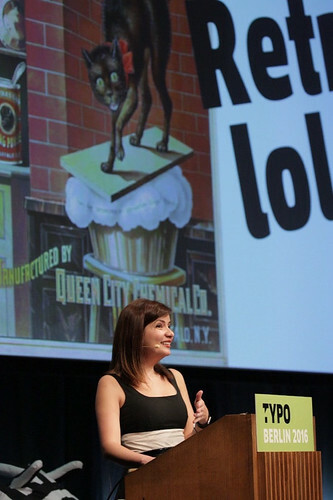 Nadine Chahine talking at Typo Berlin 2016. © Gerhard Kassner / Monotype. 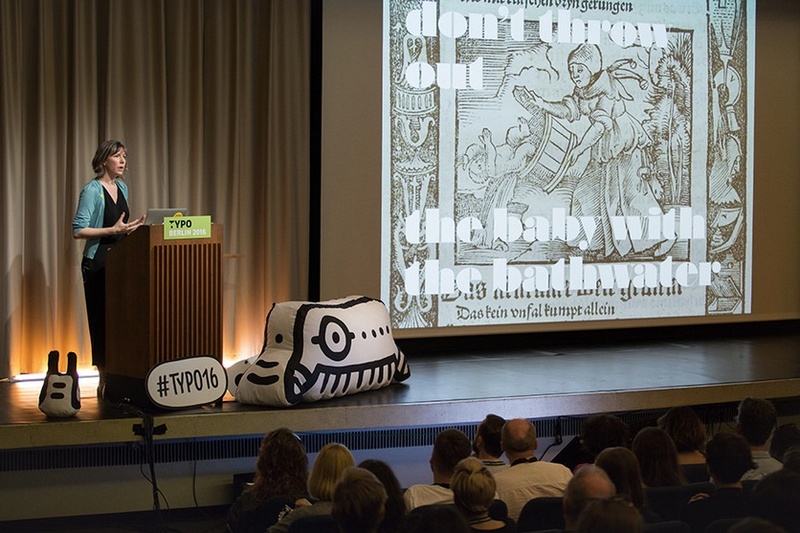 Top: Catherine Dixon at Typo Berlin 2016. 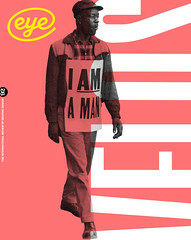 © Sebastian Weiß / Monotype. Armin Lindauer quietly presented a stunning sequence of visual experiments. His systematic and mathematical processes (documented in Experimental Design: Visual Methods and Systematic Play, with Betina Müller) have an integrity that might steer designers away from thoughtless mark-making. He alerted the audience to the dangers of reading books that used phrases such as ‘visual creativity’: ‘These are toxic words … books you should never touch! Put them in the cellar with the books on crocheting.’ Mark van Wageningen’s colourful and provocative Typewood presentation was another geeky highlight. Ferdinand Ulrich’s closing tribute to Gudrun Zapf-von Hesse – a little too frail to attend on her 98th birthday – was a moving and revealing lesson in type design’s history. Ultimately, and literally, the not-so-‘beyond’ presenters had the last word.